Popping bubble wrap is pretty calming. It’s an unconventional means to deal with anger or frustration, but hey, it works and it’s way cheaper than a session with a therapist. 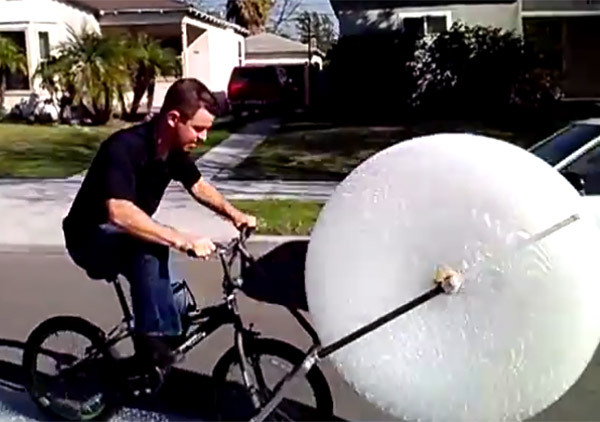 Taking bubble wrap to the next level is LA-based comedy “imaginator” Eric Buss, who came up with the fascinating contraption that’s aptly called the Bubble Wrap Bike. The bicycle isn’t made of bubble wrap, although bubble wrap is a huge component of it. The front of the bike is outfitted to hold and dispense a sheet of bubble wrap as the rider goes along. The bike’s wheels run over the bubble wrap with each push to the pedal, popping it along the way. It’s weird, it’s strange, it’s all about bubble wrap and I think it’s amazing in a cool-but-I’d-never-ride-this-myself sort of way. On a side note, what a waste of good bubble wrap!